On Oct.2, I visited SAP Canada in Montreal, and did a talk about “Creating Knowledge with Users”, which discusses Scrum, Design Thinking, and Mindmapping to show the importance of sharing experience with users to create new ideas. 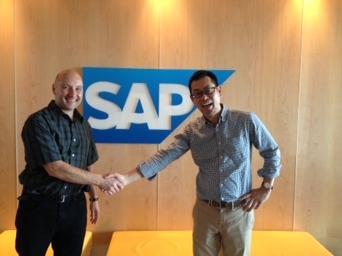 I visited in June SAP Walldorf(HQ), and did the same talk there(another blog entry here). One of the coordinators there introduced me to Montreal SAP and made this happen. SAP is now going forward to implement Design Thinking, so I thought this talk would be well accepted to their context. And, because I’m from Japan, I’d like to show something Japanese there. In the afternoon, with more developers, I talked “Modeling in the Agile Age”. This talk is the latest talk I’ve been preparing. I want to get back the importance of design and modeling back to Agile. Thank you very much Steffen and Krista for the coordination and lunch, and Tim for connecting us(and for coming to PHP Quebec next day to say hello, too). Here’s Steffen and me, in front of the entrance. We had a wonderful time in Montreal. This entry was posted in Event, TIPS and tagged SAP. Bookmark the permalink.